Professor Amitav Achary presents the Elizabeth Evans Baker Lecture. The Contemporary History Institute recently welcomed Professor Amitav Acharya (American University) to Athens as the first guest in the revived Elizabeth Evans Baker Lecture series, last held in the 1980s. In front of a 170-person audience in the Baker Ballroom, he presented “Is Peace and Cooperation Possible after the Liberal Order.” With research focusing on multilateralism and global governance, human security, and international relations theory, Acharya examined the current realities in the age of declining Western dominance over world affairs. Analyzing the popular belief that the world has recently experienced chaos as the liberal order loses its dominance on global affairs, Acharya argues that in reality fatalities from conflicts have declined for the third consecutive year. The rising costs of these acts in the past few decades has acted as a deterrent, and global/regional institutions better mediate conflicts when they break out. War is no longer a noble or cleansing experience for many nations, and a precedent now exists that there are consequences for crimes against humanity. Peace may not be breaking out, but the world is not suddenly experiencing destabilization, he asserts. The misguided view that chaos is following in the wake of a disappearing postwar order is based on multiple myths about how liberal hegemony was a stabilizing force in the first place. According to Acharya, the recent swing toward populism in the west is a consequence, not a cause, of the backlash against globalization, democracy, and institutions with deep roots in postwar liberalism. To understand who determines global order in today’s politically diverse and economically interdependent world requires new terminology. Acharya uses the word multiplexity to describe a variety of non-state actors and non-western countries across a wide spectrum who influence global order through new ideas and norms rather than material power alone. As the Western dominance continues to decline, these will likely be the entities responsible for defining and building global order. The Baker Peace Conference this spring (March 28-29) will take up these same issues. It promises to revisit the making of the post-war order in the wake of World War II, consider its challengers over the decades, and discuss its apparent fraying in the 21st century. 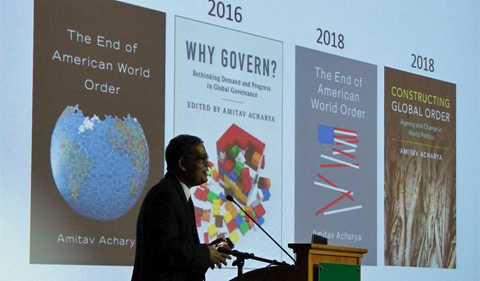 Acharya is Distinguished Professor of International Relations in the School of International Service, chairs its ASEAN Studies Initiative at American University, and is the UNESCO Chair in Transnational Challenges and Governance. He is the author of Whose Ideas Matter? (Cornell 2009), The Making of Southeast Asia (Cornell 2013), Rethinking Power, Institutions and Ideas in World Politics (Routledge 2013), The End of American World Order (Polity 2014, Oxford 2015), and Constructing Global Order (Cambridge, 2018). For more information on the Contemporary History Institute, including 2019 Spring Semester talks, events, and other CHI-related matters, visit the official Facebook and Twitter pages.